You know that awkward time in pregnancy when you’re showing just enough to make people look twice, but not quite enough that they’d risk asking about it? If you’ve ever had to travel on crammed public transport during that time, you’ll know it can be an uncomfortable trip. You’re unlikely to be offered a seat, and asking for one can in itself be an uncomfortable prospect. Well, here’s a novel solution from London. 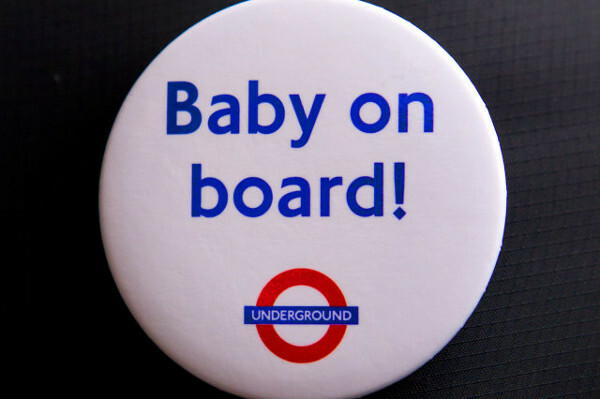 Transport for London offers free “Baby on Board” badges to pregnant women, so they can be easily identified by chivalrous fellow passengers. Commuters know they can stand for a woman without offending her; likewise, mums-to-be don’t have to ask for a seat. It also lets passengers in priority seats know when they should get up. Sydney mum Hannah Lobelson used one when when she was in London in 2012 and says it is “pretty much essential” for any pregnant woman travelling on the tube. “London tube travel in peak hour is extraordinarily and incomparably hectic with thousands of people in a mad rush to get their destination,” she says. She says most women start wearing the badge once they are in their second trimester and happy to reveal their pregnancy. “The thing is that often by then you are feeling better than in previous months when you aren’t wearing it and feeling nauseous in the crowds and desperate for a seat,” she says. Adelaide mum-to-be Mathilda Grist made headlines earlier this month for speaking out after no one gave up their seat for her on her train trip to work. “How can an obviously pregnant woman get on a train with no spare seats and not be offered one by any of passengers?’’ the 29-year-old told The Advertiser. A social analyst put her experience down to “political correctness paranoia”, with people not wanting to offend. The State Transport Minister even weighed in, asking people to be more courteous and considerate of people needing priority seats. Ms Lobelson has now pinned the badge to her pram, and isn’t sure if she’ll don it again during any future pregnancies. “I imagine in general that pregnant women in Sydney have a much easier time going about their daily life than their London-based sisters. I certainly hope this to be the case with any future pregnancies, though I may just get out my baby on board badge for old times’ sake,” she says. I looked huge during my pregnancies, so thankfully getting a seat on trains was never an issue. How about you – would a baby on board badge improve your daily commute?